So I’m fine with liking a movie that isn’t perfect. I find perfection a bit boring, honestly. But the bones of a film have to be good, like the bones of a well-built house. The Last Jedi, while an imperfect film in some ways, gives us that solid space in which our imaginations can dwell, even as it challenges and shocks us. In this way, it’s not unlike Attack of the Clones, with its misdirective title and its quite nuanced subtext. The difference is with Clones, we knew where we were headed: the creation of Darth Vader, the birth of Luke and Leia and the destruction of the Jedi Order. With The Last Jedi, we’re in uncharted territory; we’re vulnerable, floating in space with no space suit. Characters we revere aren’t who they were, characters we trust make bad decisions, and characters we don’t like turn out to be right. Events seem only to lead to devastating failures for the Resistance, for the First Order, for the Jedi (whatever that is anymore), and we do not know where the franchise is headed at the film’s conclusion. When the credits roll, we have more questions than answers. Maybe this uncertainty, in part, explains fan reaction to the film. While critics have been largely positive about The Last Jedi, the film has a paltry 50% score from audiences on Rotten Tomatoes. Some people love change, uncertainty and subverted expectations. Some people hate it. The divide over The Last Jedi has been particularly interesting with regard to the roles of women and men in the film. Some reviewers, like Kayti Burt writing for Den of Geek, claim the whole film is a diatribe against toxic masculinity – that The Last Jedi is “filled with male characters on both sides of the dark/light divide who cause and endure suffering because of their inability to deal with their emotions in healthy ways.” It’s an interesting, even alluring perspective, especially for female viewers who have waited a long time for fantasy and sci-fi stories to depict women as something more than just competent accessories to men. As I said above, The Last Jedi isn’t perfect. It suffers from moments of bad science (um, bombs don’t drop in space) and implausible storytelling (Hux just believes that Rey killed Snoke and all the guards by herself?). But whatever may be said about its flaws, the film is not simply a feminist diatribe, and to claim it is (from either a perspective of support or derision) is a gross oversimplification. Let me explain why. First, I wonder which ten minutes of The Last Jedi Bishop Barron missed with his nap. It may have been the ten minutes wherein Luke Skywalker (a man) performs the most heroic, powerful Force-manipulation ever seen in Star Wars: an astral projection of himself, which buys the remnant Resistance time to escape the First Order. Luke Skywalker saves everyone in this film, and if we’re reading ideological statements into the story, this one is somewhat paternalistic. (While we’re at it, the plot driving need, born in The Force Awakens and continuing through this film, to “get Luke back,” as if he is the magic-man antidote to all their problems is not exactly empowering for the female leadership of the Resistance.) Many reviewers, like Bishop Barron, chafed at the version of Luke we get in the beginning of the film. Sure, Luke begins the story “embittered and afraid,” as Barron points out, haunted by his own failure. But he ends it in a very different place, two places, actually: where he is and where he ought to be. He was incapable of this in Empire Strikes Back, but here, he has risen above both the isolating fear of shame at his own failure with Ren and the impetuous need to run off and play the hero of his younger days. As both its title and final scene suggest, Luke Skywalker is the hero of this film. And for those like Ms. Burt, writer of the Den of Geek review, who seem to think women in this film can do no wrong, and the men are all emotionally stunted, mansplaining, egomaniacs whom the women need to fix, I wonder: have they not noticed that everyone in this movie fails, men and women alike? I have an idea. Let’s stop putting characters into cramped, gendered boxes and simply look at each person as a human, acting in the world (or in the galaxy, as the case may be). When we do, the subtext of failure and our human response to it becomes quite clear, and it takes no sides in the gender wars. Poe fails his mission to blow up the Dreadnought. He thinks he succeeds because the Dreadnought blows up, but the mission represents a failure for Leia and the Resistance, because their entire bomber fleet is destroyed, with many lives lost. (The biggest motivation for destroying the Dreadnought was that it was a “fleet killer” … well, now the fleet has been killed… so…) The Resistance fails to get away because they are being surreptitiously tracked by the First Order. Finn, in a moment of failure, tries to desert and even fails at that because Rose calls him back to his duty, in the midst of her own grief as a casualty of Poe’s failure (her sister’s death). So Rose and Finn, with Poe’s help and direction, embark on a complicated mission to disable the First Order’s tracking mechanism. This mission fails, of course, and Finn and Rose’s excursion also exposes the Resistance transports which are fleeing the First Order. Yep, another failure – this one for Admiral Holdo, who sought to preserve the Resistance by loading them on transports, rather than put up a fight. Holdo protects the quickly diminishing transport fleet by blowing up Snoke’s ship (success!) but at the cost of the cruiser and her own life (failure! the ultimate kind!). On Ahch-To, Luke’s past failures with Ben Solo haunt him to the point of embittered isolation and cause Rey’s mission to bring him to the Resistance to fail (she never does succeed in this, although Luke arrives eventually, in his way). Rey’s dialogues with Kylo Ren fail to meet her objective of turning him back to the Light, including their in-person meet-up, which was pretty disastrous, as in-person meetings in long distance relationships go. In this film, everyone’s mission fails. Men fail, women fail. Failure and how we respond to it is the main message of The Last Jedi. If men fail more than women, it is because they have made the mistake (both in this film and in history) of assuming that destroying is the way to save. Poe destroys the Dreadnought (and his own fleet), Luke was tempted to destroy Ben Solo (and thus destroyed his new Jedi Order), Finn tries to destroy the First Order super-cannon (almost destroying himself). In this last act, the real lesson of The Last Jedi comes to a head. Using the wisdom Rose has gleaned from her sister’s heroic yet ultimately pointless death earlier in the film, she teaches Finn that it is not through “destroying what we hate” that the fight will be won. Rather, it is through “saving what we love.” This is the Jedi value that was lost during the Clone Wars, when the Jedi became generals of war instead of guardians of peace. It is what Anakin Skywalker lost sight of in his obsessive love of Padmé: that destroying others could never save his beloved’s life. Love in the Star Wars worldview is an open-handed love, not possessing that which is loved, but always ready to sacrifice self for the one loved, for the good of all. Namely, love is “saving what we love.” Just ask Han Solo. The Last Jedi is replete with failure, and these mistakes will matter to the story as the franchise moves forward to its unknown destiny. However, so will those seeds of success planted in the soil of characters’ seemingly epic failures. Poe did blow up that Dreadnought, after all. Holdo did prevent the Resistance from being wiped out completely by her many sacrifices. Rey did occasion the death of Snoke by meeting up with Kylo Ren. In Finn and Rose’s misadventures, they did manage to bump off Captain Phasma (though I’m predicting here and now that she’ll be back). Luke’s Force-projection ruse did buy enough time to save the Resistance. And Rose and Finn’s earlier visit to Canto Bight seems to have planted seeds of rebellion and hope in some unnamed Force-sensitive children, who carry the legend of Jedi Knight Luke Skywalker forward into the future as the film closes. To err is not male, not even in a new, modern Star Wars franchise. To err is human. And a film with women at the heart of the story is not “aggressively feminist.” It may not be feminist at all. It may just be how the story goes. I think you have found the real source of dissatisfaction of fans. Characters they may have revered show weakness and failure. In many ways, people look to movies and books to help them escape from the real world. They want their heroes invincible. Especially in the days of internet fandoms, anything that detracts from their idealized view of a character is met with derision. To them, if it is said that Luke had weaknesses that contributed to his actions, it is sacrilege. And then, to not fully appreciate his heroic actions in the end, but cry that Luke “is dead” is in some ways missing the whole point. I suppose one could argue that if he had come earlier, maybe he wouldn’t have had to sacrifice himself. In the future, however, he will be coming back as a kick*** Force ghost!! I personally LOVE the idea that the Force is available to all and that it will be carried on by those like the boy at the end. In going forward, I am curious to see how the theme of balancing the Force is developed. I am a little leary that with two different writers and directors that some of the main themes will be ignored or diluted. I’d like to replace #3 above with Qui-Gon Jinn. The end. What a terrific article, Emily! I love the idea of a failure being able to be transformed into something positive. That’s actually quite realistic, isn’t it? I really enjoyed the film – I’ve seen it twice, now – and was amazed when I heard that it was disliked by so many. 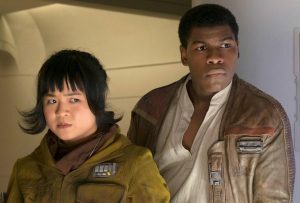 Yes, there were bits I’d change: Finn (so ace in Force Awakens) seemed a bit side-lined but I loved Rose and really want to see more of her. I wasn’t as struck with Admiral Holdo as everyone else seems to be. It wouldn’t have hurt her to have explained the plan to Poe and the rest of the crew, even if Poe was on the naughty step. And, of course, there’s Luke. Blimey, that last scene was good! What a send-off! He was an old grouch for most of the film but he was always compelling. I love too the idea that the Force doesn’t have gate-keepers but is there to be found by everyone. Did anyone else think that Kylo Ren killing Snoke may have a high degree of self-interest? After all, he immediately becomes Supreme Leader, after convincing the gormless Hux (who’s also Bill Weasley, of course) that Ray single-handed took out Snoke, all the guards and, presumably, himself. I read Bishop Barons article and get what he means about A New Hope having the hero’s journey, but surely the confusion and failures of TLJ are what it must seem like when in the thick of the action. I don’t know where the next film will take us, but it’s going to be good. That unanswered message to the outer rim will surely pay off somehow. BTW, my daughter Elspeth (a former student guest on mugglenet Academia, a keen Star. Wars fan and a BA in Film Studies from Glasgow University) has a really interesting article about TLJ on her blog. I’ll check it out, Dolores – and I love your takes on the film. Yes, this storytelling in this film had a gritty real-ness to it that suits the Star Wars aesthetic perfectly. Used universe, indeed. Thanks, as always, for reading. 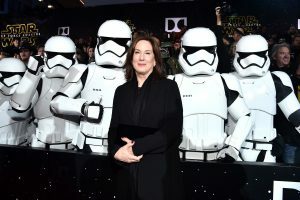 Dolores, your daughter’s blog is one of the best explanations I’ve seen on the differences this film has to previous Star Wars films and why the fans have reacted to it as they have. I’d prefer to see the adult Anakin as the Force Ghost again, instead of the kid. I hope that’s possible now that Disney owns the story. Excellent review. You say much better than I did in my own review what I think about the film, especially on the subject of love in Star Wars. I love how you link that with the last movie and Han. Soooo……Star Wars, The Last Jedi was a disappointment to a portion of the Star Wars fandom as it portrayed “weakness”, “failure” and uncertainty in most of the main characters of this film….particularly Luke Skywalker. Well….did not the many young (and elder) Star Wars Fans heed the words of Master Yoda ? “Heeded my words not, did you? Pass on what you have learned. Strength, mastery. But weakness, folly, failure also. Yes, failure most of all. The greatest teacher, failure is. Luke, we are what they grow beyond. That is the true burden of all masters.” Luke, Rey, Finn, Poe, Leia and yes even Kylo faced their own forms or moments of failure, depression, angst and folly in this latest epic. But is that not how we learn in life, both in the world of reality around us and in the “fantasy” realm that is a “reflection” of our own Universe….or a Galaxy far, far away! I minister in Christian Apologetics within the church and I’m sure Bishop Barons would guess where I am going with this point. The Greatest Teacher in the Christian Church placed this truth in the Word (Logos), ages before the thought of the Jedi came to be….”But He said to me, “My grace is sufficient for you, for My power is perfected in weakness.” Therefore I will boast all the more gladly in my weaknesses, so that the power of Christ may rest on me. That is why, for the sake of Christ, I delight in weaknesses, in insults, in hardships, in persecutions, in difficulties. For when I am weak, then I am strong.…”2Corinth 12:9-11. This truth then is how we find our way to the “Light” or if you will…. the good side of the “Force”, because we live in a Universe subject to weakness and decay (Second Law of Thermodynamics}. 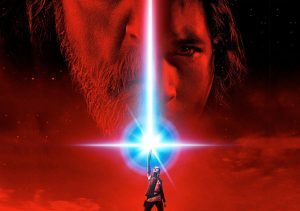 We….each of us has the capacity to learn from our weaknesses just as Luke, Rey, Poe and the others have in this story and gain from those lessons that are sometimes painful, just as it was for Luke to overcome his failure with Ben Solo, but at a great cost, that for some Star Wars fans was too great. The great part of Luke’s teaching to us all before he was lost to the otherside of life, is that the “Force” is available to ALL of us not just the “Jedi” and that means male and female. I’m just glad that Disney is being adult about its Star Wars acquisition. I’d cringe if SW9 contained, for example, a cameo by Darth Mater, from Cars.